It's a little difficult to get things done because both kids want to be held. They are generally not content with you just being in the proximity or even in the same room. You must be holding them. Sometimes they don't even want you to be sitting down. I suspect they are extra sensitive to the difference in atmospheric pressure that an extra foot or two might bring. The most they will concede is take turns being held. So the only time I get anything done is when they are napping or distracted by one of their toys. The nap buys me an hour or two, the toys about 15 minutes tops. While the weather has been warm enough on certain days to take them outside, those days were rainy and thus outside wasn't really an option. 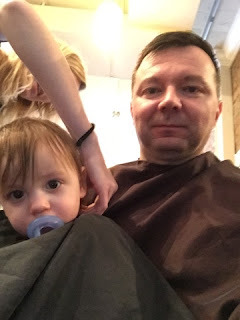 I did take them to my hair stylist on Thursday because I was getting cabin fever and it was an opportunity to get Boris hair cut too. My stylist works quickly but doesn't like to do an incomplete job. However we had to cut it short because Boris was not too happy about it and cried. Still, it looks much better than it did before. "They are generally not content with you just being in the proximity or even in the same room. You must be holding them." Yes - THIS has been and continues to be my experience. It's why I didn't even try to do homework until the kids were in bed back in college, and even now I can only work from home if I bribe the two older ones to babysit their little brother. Those people that DO manage to get things done while at home - they need to teach me whatever brand of witchcraft they practice.